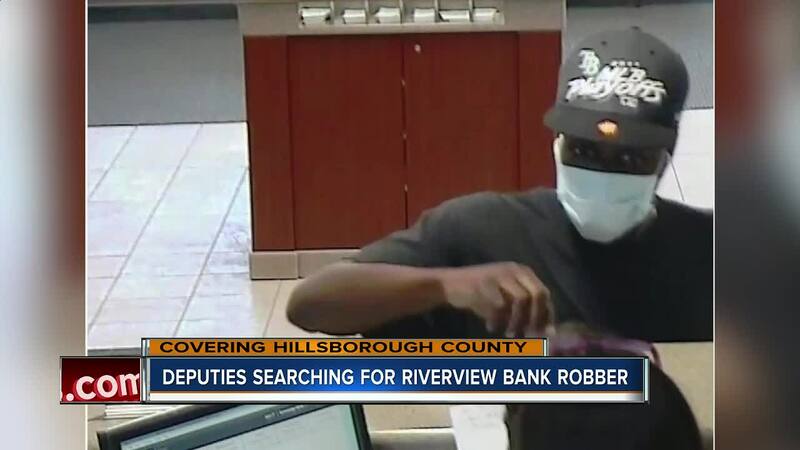 HILLSBOROUGH COUNTY, Fla. — The Hillsborough County Sheriff’s Office is on the lookout for a bank robbery suspect, who was wearing a special edition Tampa Bay Rays playoff cap at the time of the crime. Friday morning around 11:40 a.m. the Fifth Third Bank in Riverview was robbed. The suspect is described as a black male between 5 feet 8 inches and 6 feet tall. Weighing between 130 and 150 pounds. He was wearing a black t-shirt, dark colored jeans, dark colored shoes and the Rays hat. He covered his face with a medical face mask. The suspect approached the counter and used a note demanding money. He took an undetermined amount of money. He left the scene in an unknown direction and by unknown means. Anyone with information can call the Hillsborough County Sheriff's Office at 813-247-8200. You can also send an anonymous tip from a smartphone by using the HCSOSheriff app. It's available for android and apple devices. Th be eligible for a cash reward call Crime Stoppers at 1-800-873-TIPS (8477), or report anonymously online here.